Our mission is to support educators and providers in making lasting change based on best practices - which ensures children being ready for school. 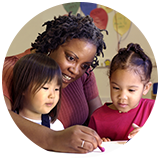 The Early Learning Success curriculum empowers providers with the tools they need to support children for school readiness. Our curriculum provides a framework of engaging learning activities that will support your program’s philosophy and be easy for your team to integrate. Help students develop analytical and critical thinking skills with engaging activities that address all domains of development.